Type: Card shuffler. Fully automatic card shuffler. Machine that automatically shuffles playing cards. Operates quieter than an automatic shuffler. Shuffles 2 decks of cards in seconds. Do not need to insert line, easy to move. Battery operated card shuffler. Just need push of a button, easier on your cards than manual shuffling. Perfect for bridge or poker sized playing cards. Easy to automatically shuffles up to 2 decks of cards. The shuffling and dealing machine is suitable for 1-2 decks of playing cards. Plastic cards, playing cards, wide cards, and narrow cards can all be used. You can manually deal cards after shuffling. Battery operated card shuffler. Just need push of a button, easier on your cards than manual shuffling. 1 Poker Playing Cards Automatic Shuffler. Perfect for bridge or poker sized playing cards. Easy to automatically shuffles up to 2 decks of cards. Evelots Four Deck- Automatic-Battery Operated- Casino Playing Card Shuffler. 1-2 Decks Automatic Card Shuffler. E27 15W LED Bulb Anti-Mosquito Insect Zapper Flying Moth Killer with lamp Holder. Tongue Trick Prank Magic Horrible Tongue Fake Tounge Realistic Elasticity Toys. Whiskey Glass Cup With Cigar Holder Groove Rack Kitchen Bar Wine Drinking Mug ♫. 1-2 deck wooden automatic playing card pocker shuffler Set of Small Blind, Big Blind and Dealer Button. Shuffler LxWxH Size: Approx. 1 Piece Card Shuffler. - Shuffles up to two decks of standard playing cards. Electric Automatic Shuffler Poker Cards Shuffle Machine For Casino Playing Deck. Just need push of a button, easier on your cards than manual shuffling. Perfect for bridge or poker sized playing cards. 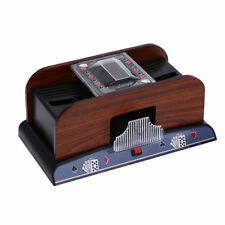 Casino Deluxe Automatic 2 Deck Card Shuffler Poker Texas Hold’em Black Jack NEWIn original box. Great addition to your collection! No complaining here, if it points at you, you gotta drink! - Evenly shuffles playing cards, ensures that cards are not accidentally bent. 1 piece of shot glass. - 1-2 Decks Automatic Card Shuffler. This product does not include poker cards. Wooden case, high-grade appearance, better quality, size: about 24cm 14cm 10cm. Shuffling a deck of playing cards. Shuffles 2 decks of cards in seconds. Fits all standard sized cards. Up for your consideration comes these 2 excellent condition Uno items. The Uno card shuffler has minor general wear, has been tested, works and would need batteries. The Blink card game is brand new and factory sealed. 1-4 Decks Automatic Card Shuffler. 1 Piece Automatic Card Shuffler(1-4 deck). - Evenly shuffles playing cards, ensures that cards are not accidentally bent. - Material: Plastic. Size: Approx. 1-2 deck wooden automatic playing card pocker shuffler dealer button. - Card Shuffler Material:Wood Plastic. Card Shuffler LxWxH: Approx. 1 Piece Card Shuffler. - Shuffles up to two decks of standard playing cards. Wemco Electronic Card Shuffler with 2 Decks of Cards. - includes 2 decks of playing cards and the electronic card shuffler. Shuffler is (New ). It’s the only 1 to 6 deck shuffler available that can be plugged into an outlet. · It has an ON/OFF switch. No more having to keep your finger pressed down on the button while the cards are shuffling. Automatic Card Shuffler 2 Deck Casino Playing Cards Sorter Poker Games Black . Condition is Used. Shipped with USPS Priority Mail. Professional card shuffler Shuffle king 2. The Shuffle King is a two deck shuffler. This will lead up to 8-10 hands more per hour. - Shuffling cycle 35 sec. - Increase productivity. - Easy handling. Type: Card shuffler. Fully automatic card shuffler. Operates quieter than an automatic shuffler. Shuffles 2 decks of cards in seconds. Do not need to insert line, easy to move. Batteries not included. 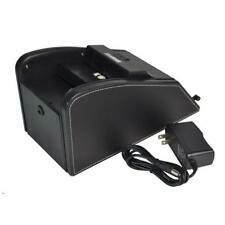 This Automatic Card Shuffler(2 Deck) is battery operated. It shuffles standard or bridge sized playing cards. Playing cards and 4 "AA" Sized batteries not included. Plastic automatic card shuffler. Vintage Arrco Playing Card Shuffler Hand Operated Red and Black W/ Instructions. This is a vintage item, preowned in excellent condition. This item has been well cared for and includes the instruction sheet. Please see pictures and let me know if you have any questions. Approx size 6“ x 6“ x 6“. Thanks for looking! NEW IN BOX SHUFFLER ONE OR TWO DECKS WITH THE TOUCH OF A BUTTON. PERFECT FOR BRIDGE OR POKER SIZE PLAYING CARDS. TAKES ONE 9V BATTERY (NOT INCLUDED). WILL FIT ALL STANDARD SIZE PLAYING CARDS. SHUFFLES 2 DECKS OF CARDS IN SECONDS. SHUFFLER TAKES 4 AA BATTERIES- NOT INCLUDED. THERE ARE NO PLAYING CARDS INCLUDED EITHER! CARD SHUFFLER HAS BEEN TESTED AND IT WORKS GREAT! Shuffle with ease with the Bicycle Automatic Card Shuffler. The shuffler is battery operated and shuffles standard or bridge-sized playing cards. Can hold 1-2 decks of cards. Easy enough for kids to use. Never reach across that long poker table ever again with this automatic card dealer! Deal playing cards face down or face up (FLOP). Deal cards with accuracy and precision. The "Wheel-R-Dealer" makes dealing not such a slow process and easy even for a person with limitations with fingers. 1-2 deck wooden automatic playing card pocker shuffler. 1 Piece Card Shuffler. - Shuffles up to two decks of standard playing cards. Due to the difference between different monitors, the picture may not reflect the actual color of the item. 1-2 Decks Automatic Card Shuffler. 1 Piece of Automatic Card Shuffler(1-2 deck). - Evenly shuffles playing cards, ensures that cards are not accidentally bent. - Material: Plastic. 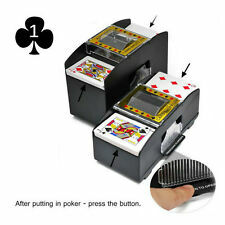 2 Deck Automatic Card Shuffler Poker Cards Shuffle Machine Casino Playing Decks. Type: Card shuffler. 1x Card Shuffler. This Automatic Card Shuffler (2 Deck) is battery operated. It shuffles standard or bridge sized playing cards. VINTAGE ARRCO PLAYING CARD SHUFFLER - AUTOMATIC BATTERY OPERATED w/ORIGINAL BOX. Condition is Used. Shipped with USPS Priority Mail. Item has not been tested. Includes original box, automatic shuffler, manual, and 2 decks of playing cards. I do accept returns within 30 days as long as item is in original condition when shipped out. Also buyer is responsible for shipping fees associated with return. If you have any questions on this item feel free to message me anytime. Please check out my other listings and thank you for looking!